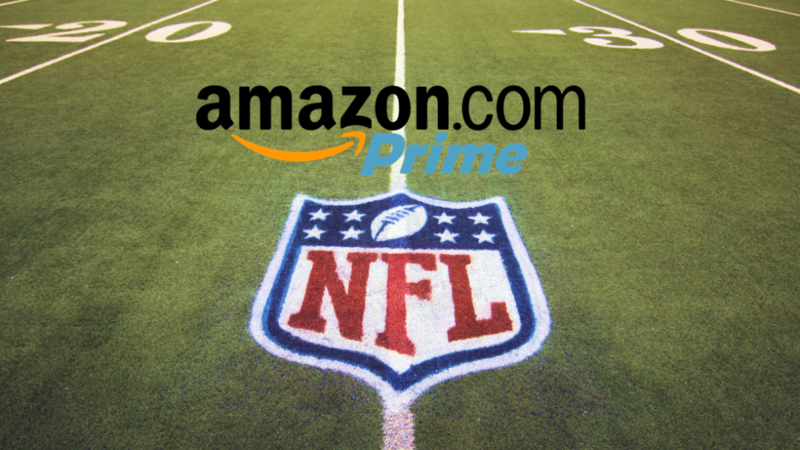 Amazon Prime Video and the NFL – Was it the right choice and which sports should they set their sights on next? After spending the 2016/17 NFL season being live streamed on Twitter, it was announced last week that the 10 NFL Thursday Night Football games will be moving to Amazon Prime Video. The deal, which some are saying could be the one to shake up TV advertising and intensify targeting and dynamic delivery of adverts, is said to be worth $50 million – five times what Twitter paid for the same number of games last season. 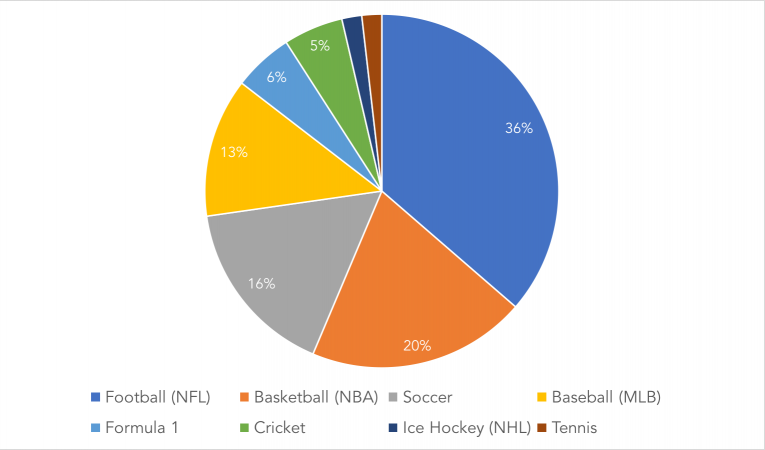 To mark the big move by the retail giant, we used the EntSight Sports Constellation tool to identify which sports the Prime Video audience have the strongest affinity and interest towards. 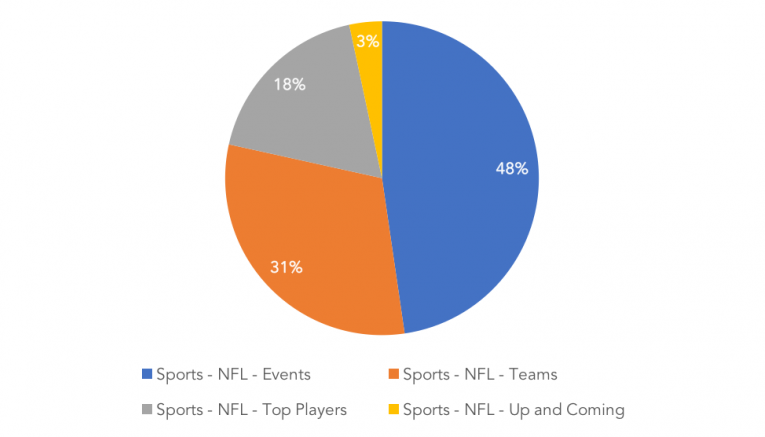 By looking at the chart above, it is clear to see the Prime Video audience has the strongest interest in Football (NFL) (36%), followed by Basketball (NBA) (20%) and then Soccer (16%) with little or no identified interest in other sports such as Golf, Polo, Sailing, Rugby OR UFC. Delving deeper in the Prime Video audience who are also fans of the NFL, we can see it is events such as the Super Bowl which the Prime Video audience have the greatest interest towards, followed by their favourite teams. With this level of audience intelligence available to brands and entertainment companies such as Prime Video there is a perfect opportunity for them to fully understand their customers and their preferences, habits and motivations - and ultimately the best means to engage them. Not only have we identified Football (NFL) as the most popular sport among the Prime Video audience, but our Sports Constellation tool also allows us to identify the most popular teams and favourite players of the audience. The Top 3 NFL Games for the Amazon Prime Video Audience. Looking at the most popular NFL teams of the Prime Video audience, the most popular games in terms of audience interest would be the New England Patriots vs Denver Broncos, Seattle Seahawks vs Dallas Cowboys and the Minnesota Vikings vs Carolina Panthers. However, as the NFL has yet to release the schedule for the 2017/18 season, we’re going to have to patiently wait until we know which Thursday Night Football games will be streaming to Prime Video. 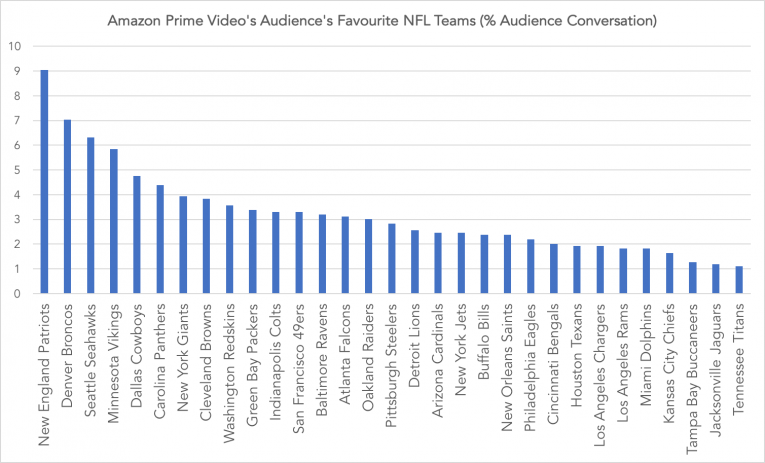 Through our research into the Prime Video audience, we have identified that Football (NFL) was in fact the most popular sport, confirming that Amazon had made an intelligent decision here. Whether Amazon will achieve their goals of diversifying their content to attract more mainstream TV consumers and secondly, learn from delivering dynamic TV adverts (adverts tailored to each user based upon their user history on the site) is yet to be seen and will likely remain unknown until the official figures come in after the 2017 NFL Season. So, Where Does Amazon Go Next? Looking back to our very first graph, it was clear to see the NBA was the second most popular sport for the Prime Video audience, followed by Soccer. Securing a deal with the NBA might a little harder for Amazon, due to the fact Facebook may have beat them to the dotted line. Back in January, the NBA livestreamed a regular season basketball game directly to Facebook for the first time. However, the game between the Golden State Warriors and Sacramento Kings, was only available to Facebook users in India. We’ll be watching closely to see if the NBA jump ship and join their NFL counterparts on Prime Video. If you're interested in learning more about the Audience Intelligence solutions we offer here at EntSight, then take a look at our website to find out more or drop us a message.